When I stepped outdoors around 7 o’clock to walk the dogs this morning, the air temperature was 11 degrees F and today’s high is predicted to reach only the freezing point before we plunge into bitter cold again. Recently, I read this winter is the coldest in two decades, but I’m not sure that’s true. I simply can’t remember another winter in South Carolina as cold as this one. And next week doesn’t look any better. 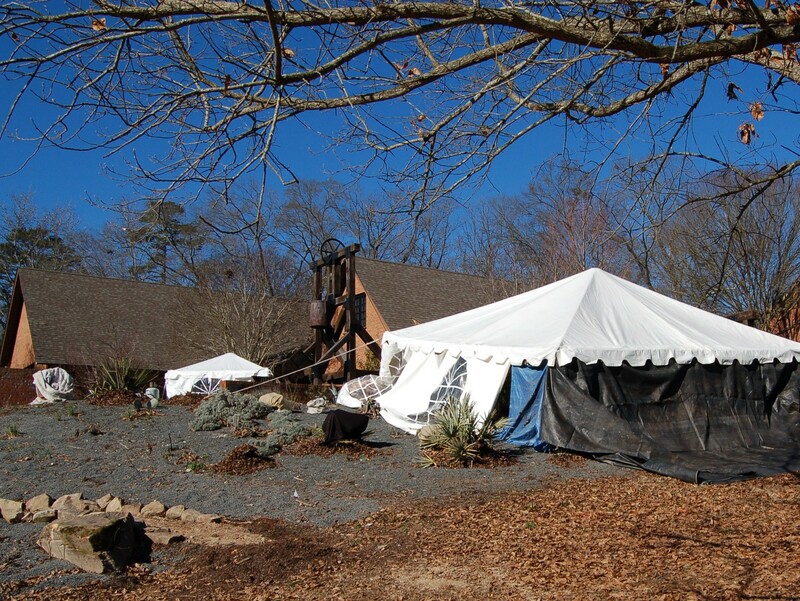 On January 8th, during the Polar Vortex, I visited the South Carolina Botanical Garden in Clemson and found some of the most tender plants near the Bob Campbell Geology Museum covered with tents. 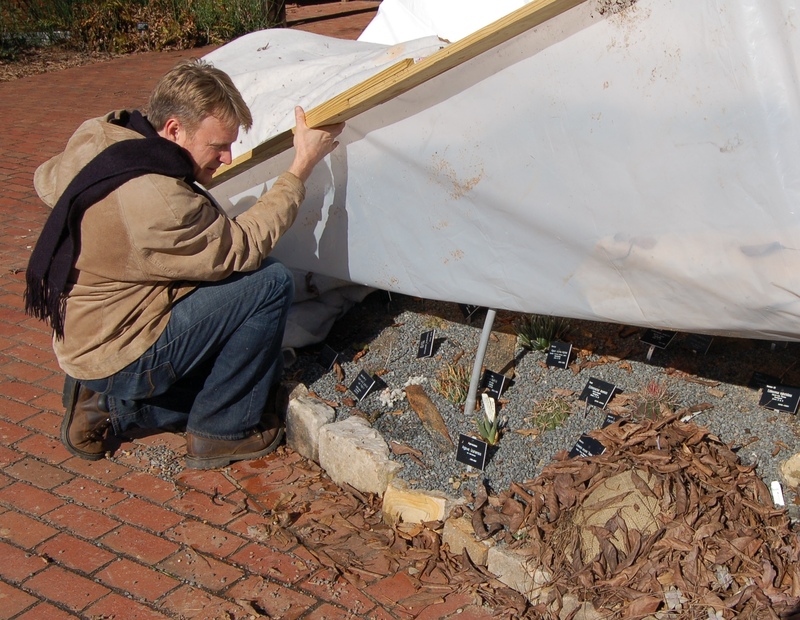 Heated tents protect tender plants at SCBG. SCBG’s Director, Patrick McMillan (also host of the Emmy-award winning ETV nature program Expeditions), was on hand, so I had the opportunity to get a close look at measures taken to protect the collection of dry-climate plants. Patrick was particularly concerned about Lithops, commonly called living stones, a species native to South Africa. Interestingly, Lithops evolved into its stone-like shape as camouflage from hungry animals. Patrick McMillan checking the plant collection, including Lithops, which is under cover in the lower right corner of the photo. 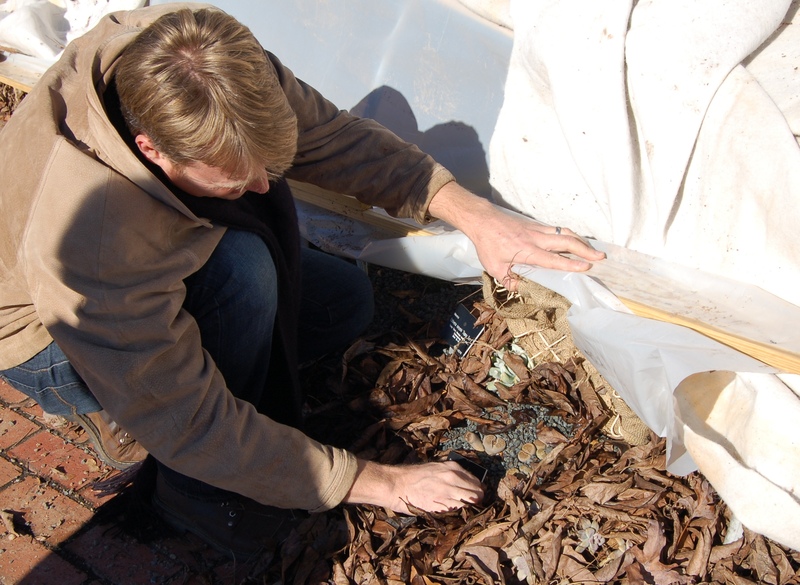 Patrick used a hanging basket filled with leaves to provide insulation around the treasured plant. When the basket was lifted and the leaves moved to the side, Lithops was discovered safe and sound. 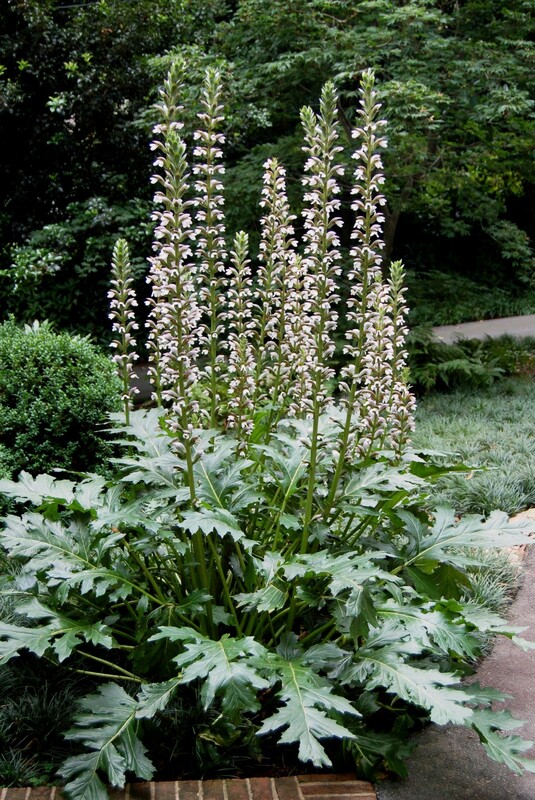 I adopted Patrick’s method in my garden a few days ago when the weather took another turn for the worst, using 3-gallon pots and dry leaves to protect ‘Summer Beauty’ Acanthus. In past years the foliage had survived winter with only slight damage from the cold, but the Polar Vortex did it in. Fingers crossed that the crown of these plants will make it through and live to grow and bloom again. Acanthus ‘Summer Beauty’ under wraps. Acanthus ‘Summer Beauty’, June 2, 2013. 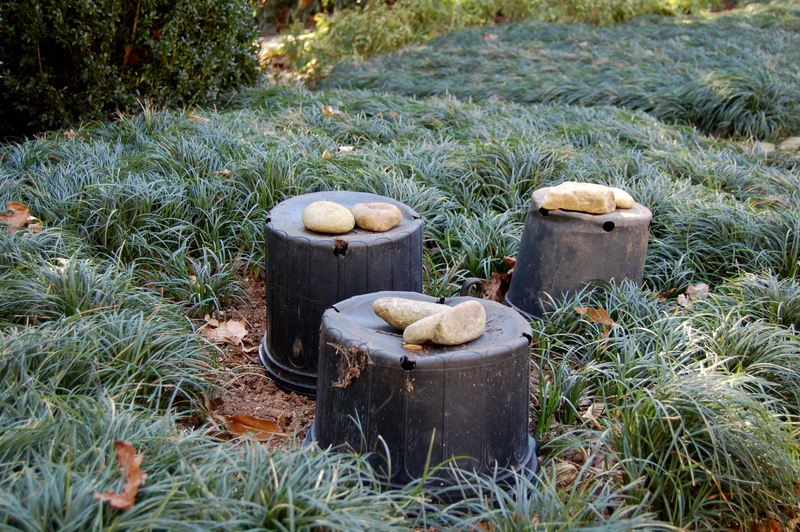 This entry was posted in Gardening, Nature and tagged Acanthus 'Summer Beauty', Expeditions, Lithops, living stones, Patrick McMillan, Polar Vortex, South Carolina Botanical Garden on January 24, 2014 by Marian St.Clair. Thanks. Too late for me. Those n. C. Visitors might not have much to see . Yes, if this keeps up there won’t be anything left! Good luck! I’m afraid we’re going to lose quite a few garden delights this winter. Such a shame when you lose favourite garden plants, gardens that are open in the winter can teach us so much about protecting our plants. I hope your plants survive, you have had it very cold for so long now hopefully the temperature will rise soon. We’re having similar weather Marian. I don’t remember such sustained cold in a number of years.